Discussion in 'Effects, Pedals, Strings & Things' started by JubileeMan 2555, Jan 23, 2012. Over the weekend I did something some may frown upon, but I'm happy I did: I took my 33000 serial# EP3 and converted the circuit to a pre-9450 Serial# circuit. I did this for a few reasons but it all started once I looked into those EP booster type pedals, I found that the "magic preamp" circuit was NOT the circuit in the front end of most EP3 echoplexes. The circuit they choose to copy is from the small 400-500 unit batch of EP3s at the beginning of the model's creation. I then took some serious time and investigated the WHOLE schematic of both iterations of the echoplex and found numerous changes. The big deal is you've got all three kinds of changes: adding, subtracting, and changing. This means there is quite a bit of difference between the circuits, and I have a feeling the "Good" ones famous tones have come from might be from that elusive batch of 400 in the beginning. Since too much time had passed since hearing the unit stock, I can't quite comment on the overall tone of the preamp, but I do feel like it sounds better in that respect. Overall, I seem to enjoy playing it in the signal chain more then before. But because of the tricks our minds play on us, I can't say for certain its a huge change. The BIG surprise, was how the unit now handled multiple repeats. Before this conversion, I could really only live with 3-4 repeats before the echo was deteriorating too much and sounded bad. After the mods, I can REALLY crank the repeats just a hair under ocillation and the echo just goes forever. Every repeat is just as good sounding as the previous, just a little quieter. 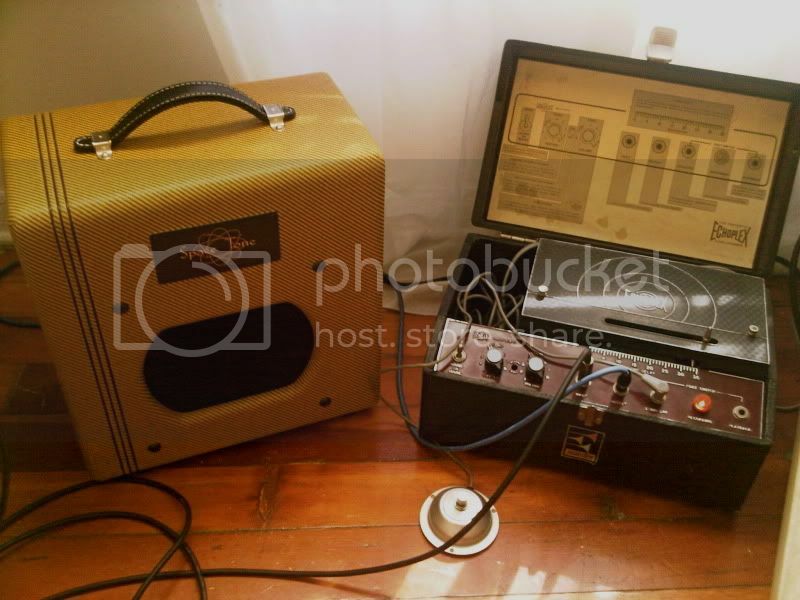 It turned my Echoplex into a reverb tank if I set the knobs right! I highly recommend this conversion. Its a bit of a hassel, but last night I was jamming with my echoplex for hours and really felt it blended better with my rig and became far more versatile. corn husk bag and Auditory Driving like this. My EP-3 is #9547 (which is clearly a bit past your Serial cutoff), but I'm fairly certain mine has the same qualities you describe. After Roy Blankenship last looked through it and I went to go pick it up, he said to me, "Yeah, you've got one of the good ones that does this..." then he cranked the repeats and they went on for a longgg-time without oscillation. Gave me a whole new use for it. I wasn't aware there was a difference in any EP-3 circuits until I just started reading some stray comments within the last year from some guys beginning to take note. So, I think it's cool that you really looked into it. Ok, so that begs the obvious question - can you tell us which of these versions the various EP boosters out there (Badgerplex, Xotic, etc.) are cloning? VERY cool! I really dig your red faceplate. Its most interesting because there are literally 10s of thousands of ep3s, but only about 4-500 with that early circuit. I'm pretty sure most of the circuit changes were probably a gradual change and thats why yours is "one of the good ones"
This is sorta a big deal because most really don't know there are differences in the circuits. So once you combine the fact that these are very old units with lots of maintenance and moving parts that can fail, most probably just buy an EP3, it doesn't do anything all that magical, and then they sell it claiming all the hype to be overblown or assume its because their unit needs servicing. They are not aware that if they brought it to the original EP3 circuit, the unit would really blossum. This also means folks who have the later version EP3s and then buy a EP boost will probably find out the boost sounds better then a real EP3! This is where internet rumor and assumptions get created with someone claiming the EP3 to be inferior without seeing the full picture. JubileeMan, I have to agree with all of your observations, and congratulate you on your insight considering that there is so much absolute bs around internet concerning the EP-3. When I put my first prototype EP-PRE together, I used the early version schematic, because that was the first in the Echoplex manual. Later, when I tried the second, it just wasn't as good. Some folks who have a later version EP-3 prefer the more mellow tone of that version, so, in more recent versions of the EP-PRE, I have included an internal jumper that allows the user to select either early or later preamp sound. Most leave it on the early version. That schematic is an exact re-draw of the early EP-3 preamp, which is only part of my EP-PRE. Sadly, a number of folks thought that it was the complete schematic, added a 50K pot to the end, and began advertising ClinchFX clones The 50K pot just doesn't cut it. Again, I agree. There is nothing else that sounds quite as good as an early EP-3, although I believe that our EP-PRE comes very close. That's cool Tyler, I need to go check out what my s/n is! And I thank you for posting that much! Without it, I may have not looked to do all this. And of course, since I'm not making any pedals, I'm not stepping on any work you've accomplished. Tyler, great info and nice clip. I see that old Marshall cab of mine in the background. Hope you are still digging it. Hell yeah I am! I love that thing! It has this great quality of mellowing everything I throw at it, but still sounding clear. Soundguy at last gig joked that the rip at the top right was for "close-micing"
I have learned that that one replaced blackback in the top left is poo-poo sounding. I'm in the market for a period correct creamback to replace it with. Thanks for posting a GREAT schematic. I wish more people did them like this. Thanks.... I do my best. The gearpage is more of a buy boutique vs do-it-yourself sorta place so there Isnt too many posters doing this kind of stuff. Should not bee too hard to find a 74 Celestion around. That cab did have that mellowing effect on things, but in a great way. Nothing like those B cabs to get tone. I also love the Write up on the EP-3. What a great unit they are. Nothing comes close to them tonally. I just got Clinch FX EP-PRE. It's nice to know where its tone was coming from. I just got mine last week. It was a bit of an impulse buy when I was bored at work and overcome by GAS. I kind of regretted it an hour later. Then the pedal arrived and I plugged it in...sounds amazing! No more regrets! i just take a sit. I've always said the older ones sounded better. I have one with SN 10880 AMD it sounds super smooth and has a lot of gain vs my SN 24,000 (can't remember the exact number). I believe the older ones have a black deck and different motors. The the older wood boxes are also thinner. Any idea what changes help with the oscillation? Mine seems to go into oscillation pretty easily after 4-5 repeats. I always though maybe it was the type of pot used(like linear vrs audio) but I guess not? Yes. I can now turn it up to about 1 to 2 oclock before it starts to oscillate. I have found a whole new use for it live. I set the time to 15 and crank the repeats. this makes for a reverb effect. Amazing.